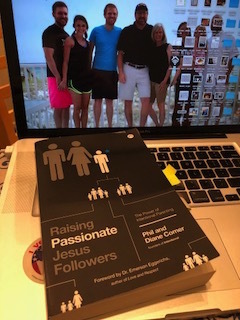 Raising Passionate Jesus Followers: The Power of Intentional Parenting by Phil and Diane Comer is one of Zondervan's new and upcoming books on parenting. I appreciate the privilege of getting an early preview copy to review. When I first began reading Raising Passionate Jesus Followers, I was a little overwhelmed by the amount of information and felt rather discouraged looking back thinking of all the things I didn’t do as a parent. I have often said that anything I did right in raising my children was only because of God’s hand involved in our family; and that is so true! We have four adult children ranging in ages 24-32 now, and I am so thankful all four love Jesus, love others, and have found their call serving God daily through their relationship with Him. As described in the book, the power of intentional parenting does not come from “doing” everything right, but from relying on God Himself. Phil and Diane Comer give great detailed training tools in this book beginning with “Formulating the Plan” including specific examples from their own experiences raising their kids. They use the illustration of building a house – ”Laying the Foundation" – birth-age 5, "Doing the Framing" – ages 6-12, Installing the “Functional Systems” – ages 13-17, “Completing the Finish Work” – ages 18-22, and finally “Opening the Front Door”. This format lends itself to quick access of information for whatever phase of life your children are presently. Each section includes personal stories, Bible verses to apply, and also ends with a quick overview that is ideal to both introduce and review the vast amount of information in each section. They also simplify the entire parenting process with "The Box" and its four important sides "which, when tightened simultaneously, create a secure frame around your child's life..." These are listed as – Jesus (always the foundation), discipleship, order, and the final side being affection, affirmation & fun! No matter what season of parenting you find yourself, this book will remain an essential reference tool in your home. Do not feel like you have to absorb it all in one reading…trust me, you will feel overwhelmed too! Phil and Diane don’t claim to have done everything perfect; they include tales of their failures and mishaps, which is very encouraging for the rest of us! Let’s face it, none of us are perfect; nor will we or have we raised our kids perfectly. Raising Passionate Jesus Followers points out two key concepts with which I completely agree: 1) We must be intentional in raising passionate Jesus followers; it doesn’t just happen, and 2) We ourselves must model that love for God and obedience to Him in our own lives for them to follow. I highly recommend this book to any parent, but especially to any that may be struggling or searching to raise their children from the perspective of eternity and the impact they can be for God’s Kingdom. Another great book with tools for Christian parenting is Praying for Your Adult Children.